Introduced in the late 19th century, the trouwboekje (marriage booklet) has been handed out to married couples for over a century, as a proof of their marriage. If your Dutch ancestors emigrated in the early 20th century (or later), you (or one of your cousins) may well have their trouwboekje in your family archive. Most married couples carefully kept their trouwboekje, and took it to the registrar when registering the births (or deaths) of their children. The booklets contain the details of the marriage (date and place) and basic genealogical data of both spouses (official names, place and date of birth, names of the parents), and have space to fill in the names, births and deaths of the children, and the deaths of the spouses. The booklet contains several pages with the regulations for birth and death registrations and registration in the population register. These documents never had an official status (there is no legal basis for them), but they were often used as identification, or proof of age or marriage. You will find these booklets only in family archives, and not in state archives, family history centers or the internet. The photos below show the pages of the 1904 marriage booklet of Hendrik van Kampen and Geertje Wiesenekker. Thank you! I learned something new. 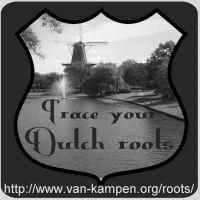 I willhave to contact other descendants of my Dutch immigrant ancestors to see if anyone has any trouwboekjen with their family documents. You're welcome, Miriam. I hope you'll succeed in locating them.